Former President Olusegun Obasanjo; the immediate past Governor of Kano State, Senator Rabiu Kwankwaso and some political parties have been meeting as part of moves to strategise for the 2019 elections, The PUNCH has learnt. A former Governor of Cross River State, Donald Duke; a former Governor Osun State, Prince Olagunsoye Oyinlola; and a former Special Adviser to Obasanjo, who is the spokesman for the CNM, Mr. Akin Osuntokun, also attended the strategic meeting. Some of the political parties represented at the meeting included the Social Democratic Party, Labour Party, Alliance for Democracy, Democratic People’s Congress, Action Alliance, Progressives People’s Alliance, Democratic Alternative and National Conscience Party. Others, who attended the Lagos meeting, were Mr. Kenneth Udete, who represented Action Alliance Party; and Mr. Okey Chukwuendu, who represented the All Grand Alliance Party. A source, who attended the meeting, told our correspondent that Obasanjo emphasised the need to work together ahead of the 2019 general elections. The source, who is close to Obasanjo, told SUNDAY PUNCH that the coming together of the various interest groups and individuals had become necessary as that was seen as the only way to defeat the ruling All Progressives Congress in the 2019 elections. When asked why Kwankwaso was invited to the meeting despite being a member of the ruling APC, the source noted that Kwankwaso had always been an Obasanjo loyalist. 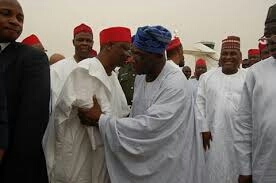 “Have you forgotten that Kwankwaso was appointed the Minister of Defence by President Obasanjo in 2003? The former governor was not invited because of his ties with the APC but because he also has a huge movement known as the Kwankwasiya in Kano and its environs. Kano is a very strategic state,” the source, a top member of one of the groups, stated. The source explained that Obasanjo stressed the need for the parties present to prove to Nigerians that they were different from the APC and the PDP, saying Nigerians were tired of the two parties. When asked why the meeting was kept secret for so long, the source said Obasanjo insisted that such strategic sessions remained clandestine. When contacted on the telephone on Saturday, Agbakoba confirmed the meetings with Obasanjo. Agbakoba, who is a co-chairman of the NIM, said the meetings would continue to hold. The Senior Advocate of Nigeria stated, “What I can say is yes, that is true. We are exploring the option of working together and those conversations are still ongoing and we have a mutually-agreed agenda that we will have to make an impact in 2019. When asked if the presence of old politicians like Kwankwaso and Oyinlola in the meetings would not undermine the quest for change, Agbakoba said NIM would be circumspect.